Whether you want to adjust color and size of the photo, crop your photos, making a collage, adding special effects and adding sound to your videos now you can perform all the task such as edit, organize and add a music that synchronizes with listener’s heart with best photo video editor app – Magix Memory Manager. PROS:- Edit any type of media regardless of the size of the timeline. For veteran users, it’s easy to operate and one can test all the functionality within a few minutes after operating the software but for beginners, you may find difficulty when operating the first time but you can learn by watching a video. Why is Magix Memory Manager best photo video editor? Add a music to your videos that synchronize with listener’s heart. Recently Shane Murray – Photography and Video expert born and raised in Newyork – the USA with more than 15 years of experience in photography has joined TechPcVipers team recently as a webinar expert. We have a conducted a webinar where the 50k audience have joined us and the topic was – “What’s the best software to edit photos and videos?” Some says we are using Macphun, Adobe, Wondershare and Cyberlink which are best software so far while some are saying that buying a separate software for both photo and video is very costly hence we can’t afford so we introduced them about best photo video editor app – Memories Manager which is available at a price point of $79.99 that let you edit your photos and videos at a single price. Editing a video can be a laborious task sometimes if you don’t have a software but Movie Edit Pro now you can easily create videos and edit videos and perform the following on task. A software has really a nice storyboard which let you add multiple elements and further moving them to your timeline thus giving a finishing touch to your project. A timeline is the most important feature of any editing tool and Magix gives you 99 in-built tracks which you can add any type of media on. Any format of video can be edited easily whether taken from a high-quality DSLR or Blue-Ray print. Export your videos once you are done with editing part and publish on your social channels such as Facebook, Twitter, Google+, Youtube. Intros/Outros, Transitions and Audio are important features of this video editing app which make it special. Shooting a video with a handheld camera can probably end up with the shaky video which doesn’t look professional hence proDAD Mercalli V2 lets you rescue shaky video footage and transform it into something amazing. Everyone in the world has saved his precious memories somewhere whether it could be in an album or in a storage device which you need to enhance or give a new look at some point of time to share with your loved ones and recall those memories again. Panoramic is a special type of photography done using special software such as Photo Manager Deluxe where you can combine eight single images to give a panorama look. Edit, organize and manage your photos and videos with ease. 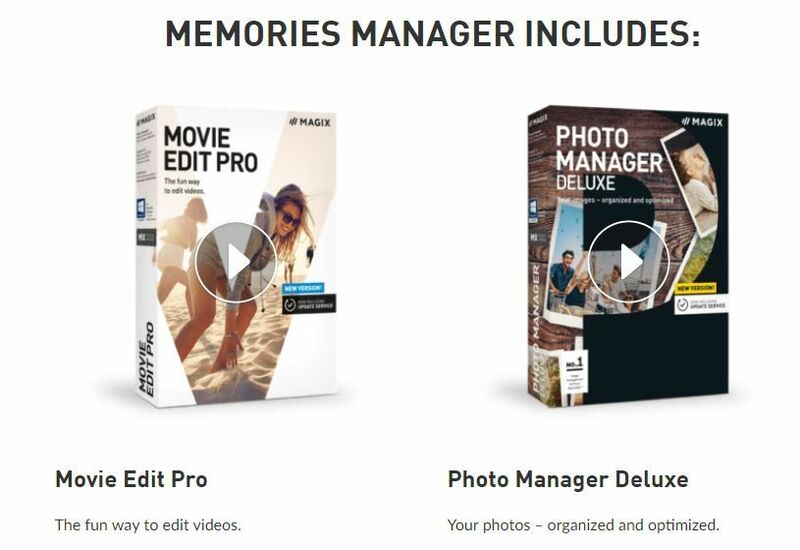 After editing many photos and videos of different file format our team of experts suggests that Magix Memories Manager is the professional photo video editor tool where you can get all the features that let you edit your photos and video easily at the best price and no need of buying a separate software.